At some point around the time Dwyane Wade was impaled, for the second time, on a doddering walkabout turnover in the paint, the wider basketball-viewing world realized that Dwyane Wade has been dead all this time, and was only now being told. But Wade was far from the only Heat carcass to wash up these Finals. Here's how bad it was: Dwyane Wade and Chris Bosh combined to post a game score of 18.5 (7.9 and 10.6, respectively). In 2007, when LeBron and the Cavs were swept by the Spurs, Drew Gooden and Boobie Gibson combined for 17.5. This is not flattering company, obviously. If you expand to the teams' top seven non-LeBron rotational players, the '07 Cavs actually pull ahead, with a combined Game Score of 42.2 to the '14 Heat's 36.2. (The average cumulative game score average for the numbers 2 through 8 players in a Finals is 47, because generally, teams in the Finals are good. The Spurs 2 through 8 combined for 66.) Which is to say, LeBron had more help in the Finals in 2007 than he did this year. LeBron's series average of 22.5 was more than twice as good as it was in 2007 (10.6), and higher than the average for the best player on a winning Finals team (20.6). Anyone watching could tell that the Heat were a one-man team, in a way completely at odds with how this team was supposed to work. Game Score is not the be-all, obviously—it's a combination of box score stats and shooting efficiency invented by John Hollinger—but it serves just fine as a broad indicator of something that we all watched for ourselves. All of this comes on top of the fact that in five games, the Spurs outscored the Heat by 70 points—more than in any NBA Finals matchup in history. The Heat were completely outgunned, and even leaning heavily on Ray Allen, or bringing out Shane Battier and Udonis Haslem, who were ostensibly in reserve for emergency use, didn't move the needle. 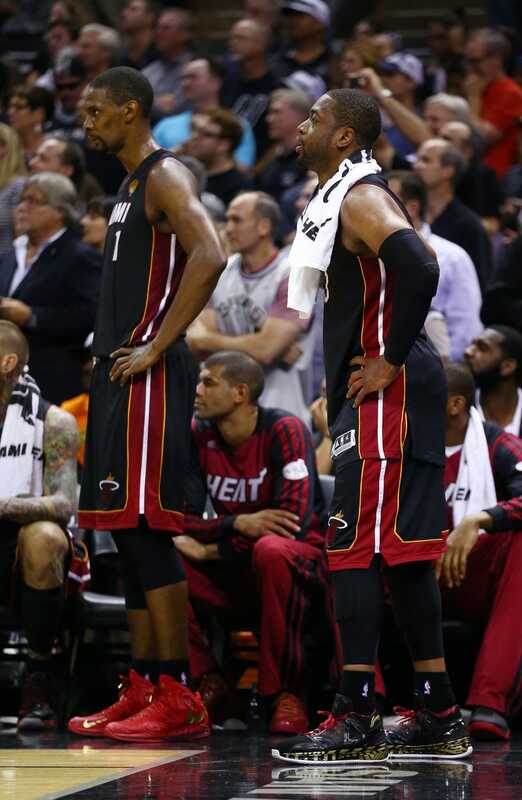 Which brings us to another point: This year's Heat were never a superteam. You don't exhume Rashard Lewis and Supercool Beas if your rotation has the component parts of a functional Finals team. You do it when functions that your system has relied on begin to break down at the most inopportune (and most predictable) times, and you don't have a built-in backup plan. So when those Bosh threes stopped falling in the Finals—like when those Danny Green threes stopped falling late in last year's series—the whole thing went to hell. These are the kinds of problems that you run into when one player is carrying two others who are paid and treated like superstars, but don't perform as such—a very high-class Larry Hughes and Donyell Marshall, you might say. And it's a hell of a lot harder to fix when you're constrained by those salaries at the upper register of the pay scale. So if Miami is really serious about keeping this thing going, it would probably be better served looking for its next Danny Green and Patty Mills than to go shopping for a Carmelo.